Here's a series of web sites that were made just for you! 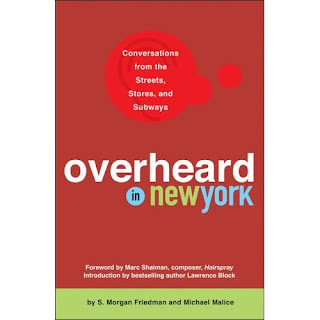 'Overheard in New York' -- 'Overheard in the Office' .... and at the beach and more! These sites capture snippets of the silly, mundane and plain outlandish conversations. Worth a read with none of the guilt of being caught earwigging in person! Subscribe & have the 10 best quotes emailed to you weekly. The folks behind these sites also have a few books circulating out there (last printed in 2008) as well if you'd like to take these real soundbites with you.